The developers of Gateway Sports Village, a proposed $300 million youth-sports-anchored mixed-use project in Grandview, announced Tuesday that Liberty Hotel Group will add two new hotels on the site, which lies on the north side of Missouri Highway 150 between Byars and Kelley roads. The first hotel, a Best Western Plus, will be integrated with soccer fields, retail space and an 86,000-square-foot multisport field house to be developed in the project’s first phase. The project’s 12 lighted artificial-turf soccer fields are scheduled to open at Gateway Sports Village next spring. Construction of the Best Western Plus is scheduled to begin around the same time. The $234 million portion of the sports village for which the developers have received incentives worth $78 million includes the fields, a field house, three hotels with a total of 540 rooms and 334,000 square feet of mixed-use space, including office, medical office, retail, restaurants and entertainment venues. It also includes a residential component, for which the developers did not seek incentives, consisting of 40 existing single-family homes and 250 planned apartments. Ultimately, the developers also plan to incorporate additional commercial space and recreational facilities into the sports village. The complex is expected to attract 1.8 million visitors a year, generating thousands of hotel rooms a night for visiting teams, players, and families. Liberty Hotel Group, which is based in Liberty, is a hotel development, investment and management company with hotel holdings across the United States. 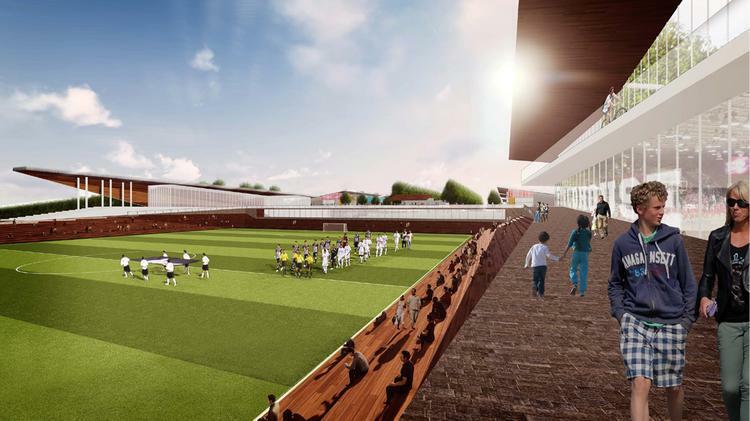 Patel was referring to the Heartland Soccer Association, which Gateway Sports Village development partner Shane Hackett serves as executive director. The Overland Park-based association operates the largest youth soccer league in the United States, with more than 30,000 participants, Hackett reminded Grandview officials last month. Heartland, which now attracts tournament teams from 16 states to the Scheels Overland Park Soccer Complex and Swope Soccer Village in Kansas City, has signed on as the master tenant and field scheduler for Gateway Sports Village, as well. Hackett said full league play will begin there in the fall of 2017.